On its surface, today’s new Hearthstone expansion, Rise of Shadows, looks like just another batch of new cards. But paired with the Year of the Dragon rotation—a major rule change that also drops today and will make some of the game’s most powerful cards illegal in the game’s popular Standard mode—the set looks like it may bring some of the most significant metagame changes that Hearthstone has seen in years. Over the last two years, the average Hearthstone game has held a somewhat distinctive flavor—one that wasn’t to everyone’s liking. The best decks relied on card synergies that seemed to break the concept of fairness, powerful Legendary cards whose inclusion in a deck could drastically boost win rates, and super-powerful combos that could kill even the greediest late game decks in one fell swoop. Compared to the game’s early days, where victories came through incremental advantages and smart, measured play, these more recent sets meant that Hearthstone’s metagame could often look like a game of rock-paper-scissors. If a certain deck was popular in the meta, you’d play something that could beat it. If you were feeling cheeky, you’d play a deck that countered the counter. Many of the game’s strongest cards are rotating out of Standard play with Rise of Shadows, from all-powerful late game cards like Deathstalker Rexxar and Frost Lich Jaina to cards like Genn Greymane and Baku the Mooneater, which gave players extremely potent Hero Powers in exchange for playing decks with exclusively odd- or even-cost cards. With all these changes on the horizon, it feels like Hearthstone is on the verge of an entirely new era. To get a better sense of Hearthstone’s philosophy in the upcoming Year of the Dragon and beyond, I talked with Hearthstone Senior Game Designer Dean Ayala about card design, lessons learned, and tapping the core gameplay interactions that make Hearthstone such a compelling game. Kotaku: The rotation of Death Knight cards might represent one of the most significant power shifts in all of Hearthstone history. What kind of lessons did the team learn from the original set of Death Knights? Ayala: In terms of what’s rotating out, and Death Knights specifically, a lot of those cards filled a role that no other cards can fulfill. I think specifically when the community is talking about Death Knights, they’re talking about cards like [Deathstalker] Rexxar and [Frost Lich] Jaina, these one-card package value generators for the entire rest of the game. Cards like that aren’t really getting replaced; it’s more just like a shift for what’s available for those classes. I mean, we certainly don’t regret making those cards, but I think that we’re happy to take a break. One of the things we were realizing was that if you’re building a really greedy control deck—say you’re a warrior, you have Ysera in your deck, and you have all these different Legendaries and control cards and these late game bombs. And then you get to a point where it’s turn 25 and you’re losing to a deck like Hunter. They didn’t really make all these deck sacrifices, all they really did was put Rexxar in. And while Rexxar is one of the most unique and really fun cards, it can kind of feel like cheating to make all these deck sacrifices so that you can play a greedy control matchup, and then lose because your opponent has this one card that is able to do that better than your 10-card package does. Like I said, those cards are really, really fun and really unique, and I’m glad they existed for the time they existed, but [it’s nice] having the shift now to: if you’re making a really big sacrifice and including all these greedy control cards, you’re gonna be paid off for that. Kotaku: What have you learned from combo decks, and what place will they have in the upcoming expansion and beyond? Ayala: [Combo] decks are cool, and we want them to exist, but it becomes a problem when they’re eliminating a whole other archetype of deck. I think if you’re building a combo deck, you should still be able to be beaten by some of these more midrangey control decks, but sometimes you’re gonna have some pretty good matchups, and that’s okay. Still, cards like Hecklebot and Unseen Saboteur, they’re really not good in some metas. So we still expect there to be a time where playing Unseen Saboteur is really bad because you’re playing against a Big Warrior deck that has Dimensional Ripper, which summons two cards from your deck. So maybe you don’t wanna play Unseen Saboteur if Big Warrior is a really big deck in the meta. And if that’s the case, maybe it’s the time to play Mecha’thun decks. The place that we don’t wanna be is [where] it’s really hard to be able to counter [combo decks], or have any strategies that are good against them unless you’re playing an aggro deck. If your style of deck is control or aggro, there should be tools for you to be able to interact with the meta in some way that don’t have to completely change your play style in order to enjoy the game. Kotaku: With the new Specialist rule set coming up for Hearthstone esports, has the design team changed its card design with that format in mind? Ayala: Not specifically—indirectly. The thing that makes esports really fun to watch is when you have these players and there’s enough depth in the game where they can really show off their skill set, and there’s enough room for them to include individual cards and packages of cards that make matchups incrementally better. We want to design our game that way—we want to keep things simple, but we want to keep things so they have a lot of depth, so these players can show off a lot of their skill in figuring out which cards in Rise of Shadows can give them an incremental advantage that helps them beat some other decks. With cards like Rexxar, there’s so little sacrifice to be made there that... It’s not really an exciting decision point when you talk about deck building for Specialist format. Whereas, when there’s a bunch of individual options that make you incrementally better in different scenarios, I think that makes deck building more exciting not just for esports, but for all Hearthstone players. Kotaku: With the introduction of callback cards, which re-introduce mechanics similar to those of previous expansions, I can’t help but think that a lot of RoS feels like a return to Hearthstone’s roots. Is that something that the team was thinking about or trying to accomplish with this set? Ayala: Something we talked a lot about in playtesting is... if your goal was to win in the last year or two in Hearthstone, it’s been like: “What package of cards can I put in? What is my combo? What is the super fast way I can get out the gates in order to win this game really early? And if I’m not winning really early, then what is my crazy package of things that I have to do at the end of the game in order to win?” Whereas in original Hearthstone, sometimes you played Ysera, and Ysera lived a turn, and that was kind of your win condition. The small amount of value, the incremental advantages, playing some bigger cards than my opponent, or playing a Flamestrike at the right time. I think when combos start to get really insane and there’s not really a way to interact them, or there’s cards that are just generating value for the entire rest of the game, the idea of, “I just played a Ysera and it stuck around and I won the game because of that” is kind of a foreign concept. Whereas in playtesting for this year, we’ve kind of come back to that a little bit. I played whatever the big minion of the set is, or I played Archvillain Rafaam and stuck that, and played another couple Legendaries and won the game that way. It tends to happen more and more when decks like Mecha’thun are a little bit less powerful because you have tools to deal with that, and cards like Rexxar and Jaina and those cards don’t really exist in Standard anymore. In general, it does play a lot more like original Hearthstone in that way. There’s still a lot of insane things you can do, but hopefully there’s a lot of ways to interact with those things. You can just play oldschool Hearthstone, where you’re playing giant minions, and gaining incremental advantage, and winning games that way. Kotaku: A lot of changes in this expansion seem to adjust every class’ identity to revolve around value just a bit more. Hunter—typically associated with aggression—got some interesting value cards, as did Rogue—a class typically associated with tempo. What are the most significant tweaks we’ll be seeing to class identities in the Year of the Dragon? Ayala: I think in general, we’re just trying to get the class identities a little bit tighter. A trap I think you fall into as a designer a lot of the time is: you give a class an identity and you say, okay, this is a Hunter’s identity. They’re aggressive, or the terminology that we use is a “forward motion class”: a class that’s always putting on pressure. As a designer, we’re always also trying to figure out: what’s the new cool thing we can do that no one’s done before? So when you’re trying to give classes identities, but you’re also trying to do things new for them, that’s how you end up with cards like Rexxar, that are like “Gain 5 armor and generate a bunch of value and become a control deck.” I think that’s something that we’re trying to pull back on a little. There’s cards like Master’s Call that are definitely value generators... you pay 3 [mana], you draw 3 [cards]. It’s hard to argue that that’s not a value generation card. But if you look at the Master’s Call Hunter decks, those aren’t late game control decks... They’re trying to deal as much damage to you in the mid game as fast as possible. The existence of value generation cards doesn’t necessarily change the class identity of that class, whereas I would argue a card like Rexxar sort of does change the identity a little bit. So we just have to be a little bit more vigilant about staying true to what these classes are about. Kotaku: The past year has seen a diverse range of popular decks in the metagame, but it still felt like there were improvements to be made. 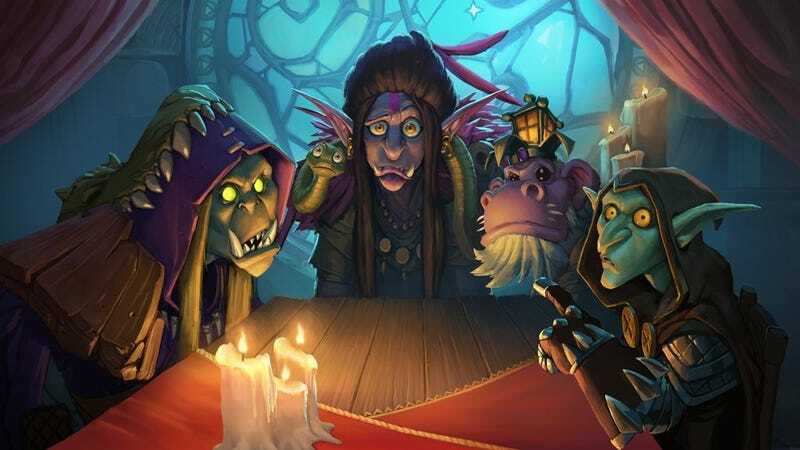 What has the design team learned about deck viability and diversity, and how will that affect the upcoming year of Hearthstone? Ayala: I think what diversity means to a lot of press outlets and players is: there’s a lot of different classes and a lot of different decks. Diversity to us is a little bit even deeper than that. There needs to be really complex decks to play. There needs to be the crazy combo Priest deck with Stonetusk Boar that requires you to do all this crazy APM at the end of the game, that appeals to a certain type of player. And there also needs to be decks like, say, Jade Druid or Murloc Shaman, where you go to your collection and type in “Jade” or type in “Murloc,” and you jam all the cards in. Diversity doesn’t just mean that there’s Hunter, and there’s Shaman, and there’s Druids, and they’re playing different decks. It also means: if I’m a new player, and I gravitate towards aggressive stuff, is there a pretty easy deck for me to build that is gonna be relatively competitive for me to play? And if I’m a really seasoned player that enjoys playing combo decks or control decks, is there something out there for me that I can gravitate to and have fun with? We don’t have a dashboard that we look at that says, okay, everyone’s playing all the classes, and all the win rates are 50 percent, we did a good job—it goes a lot deeper than that. Depending on what kind of player you are, making sure that there’s something out there for you, that’s really the goal. And if that means that some of the classes are at a 45 percent win rate for some amount of time, as long as there’s something out there for you that you can gravitate toward for fun, that’s the goal of diversity, and that gets lost a lot of the time when we’re talking about balance of cards and balance of classes. Is there something out there for you that’s fun? That’s the goal. The Week In Games: Grab Your Keyblades & Get Ready!